Lex Fun 4 Kids is a FREE online resource for fun family activities and events in the Central Kentucky area. Established in 2011 as a way to connect the families of Central Kentucky with the resources, events, and businesses available Lex Fun 4 Kids continues to grow and serve the families of Central KY.
My mission is to provide the largest, most comprehensive, family-friendly Events Calendar in Central Kentucky and to be the premier One-Stop-Shop for all family friendly content featuring things to see, do, eat, and explore! Why Advertise with Lex Fun 4 Kids? Reach a targeted FAMILY audience! The site averages approximately 50 – 60,000 page views per 30-day period. Summer 2018 numbers are nearly double this! 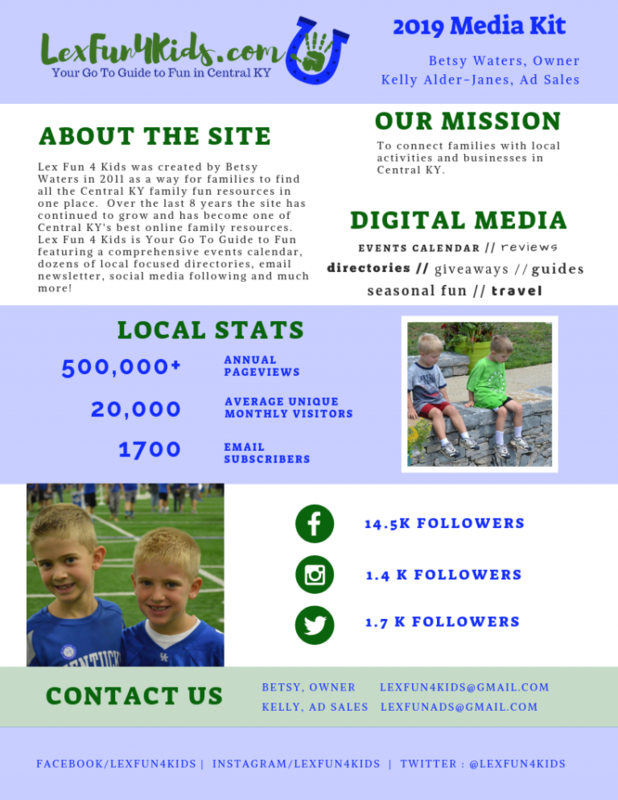 Lex Fun 4 Kids has a very large audience that grows monthly, as do @LexFun4Kids’ social networks. No deadlines. Your ad or promotion can be made live any day during the month. Upon approval, depending on your promotion choice, I can have the ad live within 48-hours. Personal service! I run the website and all content – when you have questions I’m right here to answer! Kelly Alder-Janes is my Digital Media Sales Consultant and can help you get started! She can provide you with pricing, packages, and answer questions about any advertising options we offer! Now accepting ads for our 2019 Camp Guide! Thanks so much for your interest in Lex Fun 4 Kids! To submit an event for our calendar please CLICK HERE. Thank you for reaching out. Please email lexfunads@gmail.com for more information.